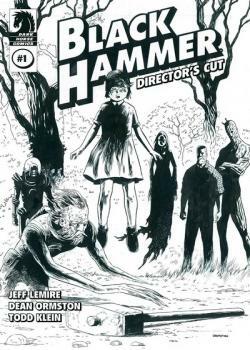 The Eisner Award–winning hit Black Hammer gets a special first-issue director's-cut edition presented in black and white. This deluxe director's cut showcases high-res, uncleaned scans of Dean Ormston's beautiful inked line art from the first issue of the award-winning Black Hammer series, with Todd Klein's lettering overlaid on top, and also Jeff Lemire's original script and a high-res scan of the original cover. A must for collectors and all Black Hammer fans!